The title sums it up really. My spouse is trying to organize a "bird" themed game night for a conservation group and asked me to think up a few titles. Aside from some bland ones from Outset Media and other publishers, I haven't really seen anything that "pops." The best I have so far is Evolution+Evolution: Flight, any recommendations beyond that would be greatly appreciated. Mechanics can really be anything, but the games should be rated E for Everybody, and also the games should be something close to readily available. Hey, That's My Fish!. There are a few other penguin titles too. I think Evolution etc. would be pretty tough for non-gamers. Edit: Crows perhaps? Though haven't played it. One of my partners is a big-time bird afficionado, so I've been on the lookout for great bird-themed games, but they're sadly less common than I'd like. Flock has adorable art. The mechanics are a little funky, but there was clearly a nod to the theme with the way it incentivizes you to behave like flocking birds. Very clever. Cuckooo! looks good, but I haven't been able to get my hands on a copy. I have Flock mentioned above as well as Go Cuckoo! which is more of a kid's game but it is dexterity so it isn't like a simple memory game or anything, could be fun even with adults. Thank you so much everyone! You've given my spouse a lot of food for thought and she has added several of your recommendations to her selection list. Although Chicken Cha Cha Cha is a children's memory game it is hilarious fun. Okiya is a 2-player game with bird art. 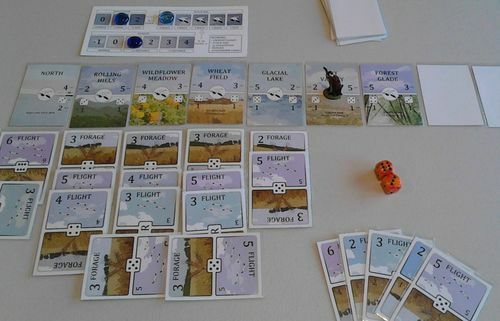 Snowbirds is a fun solo PnP game. But I could imagine setting up teams of 2-4 people each playing their own game and sort of competing against the other teams. "Inspired by the beauty of birds flying in flocks." "Based on the concept/idea of ducks competing for breadcrumbs thrown by old men. The mechanics and goal meets the concept/backstory." Both of the above are available directly from NestorGames, a small publisher based in Europe (I think shipping is ~$10 per order worldwide, not bad!). He's got quite an interesting inventory of games, and they are all travel-friendly with these cool little travel bags. would be very appropriate for a conservation group. 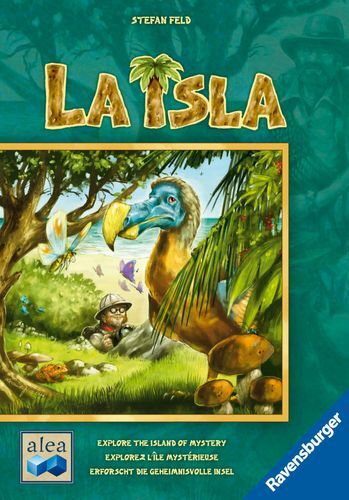 You play scientists on an island studying long-thought-extinct animals, including the Dodo! It's a wonderful Stefan Feld game, who makes some of the best Euros out there. Fauna - focus on all the bird cards, and add your own for more rare, endangered, or even extinct species. Mice riding birds in aerial combat! Although, for a conservation group meet-up, if they're really knowledgeable and "bird geeks," just a head's up that there are some issues with the geographic distribution listings for some of the species in this game, which could lead to frustrations when the answers are revealed and the points scored. Sometimes they include "introduced" distribution, sometimes they don't, sometimes a mixture even for the same species, so it gets muddy. From what I can tell, the science content was all researched online or from books, without consulting a biologist. I do like the basic idea of the game, I just wish they had put more effort into making it accurate and consistent. Thanks for that insight. I think if these conservationists were warned in advance we may have a chance to avoid their wrath and ire. Columba, bird themed area control, very pretty. There is a used copy in the marketplace. Unlikely to find in online stores. Highly recommend Birds of a Feather. As someone who enjoys birding, I think this would hit the mark with your target audience. 4 the Birds (Kickstater but I belive I've seen it available on some OLGS). Songbirds (aka Birdie Fight) - I know nothing about the game but the artwork looks nice.